In the early days of automobiles, roads were an outgrowth of old trails. Most were narrow, rutted, slippery when wet, and often local. Henry Ford's introduction of mass production in the 1910s made the automobile affordable to middle-class American families and fueled interest in better roads and in highways that would take them further. Led by independent automobile associations rather than the government, road improvement efforts over the next decade resulted in a network of named trails crisscrossing the country. One of the first to harbor transcontinental ambitions was the Dixie Overland Highway. It all began with a pathfinding exploration by the Automobile Club of Savannah in 1914 to determine whether a road across Georgia to Columbus was feasible. Successful in that endeavor, the club's leaders organized the Dixie Overland Highway Association with the goal of extending their project all the way across the U.S. to California by interconnecting local roads. Confident they were developing the "shortest and only year-round ocean to ocean highway," the association recruited partners across their intended route and chose San Diego as its western terminus, thanks to the efforts of Colonel Ed Fletcher, a local land developer and promoter. By 1925, it was clear to all that road management was a function best handled by government. And with the confusion of more than 250 named trails, many crossing state borders, the federal government became involved —at the behest of the states—to develop a numbering system for roads. In the renaming, the Dixie Overland Highway became US-80, following much the same route as its founders devised. Over the intervening 90 years, the road has shifted as development and growth demanded. Interstate highways eventually supplanted it in the far West, and today it terminates in Dallas, no longer a coast-to-coast road. Yearning for a road trip that would take us "from sea to shining sea" but getting it started so late in the year, we knew we had to look south for our route. Since we want to try to avoid what is often a dull sameness of interstate highways, US-80 and its story got our attention. Though we will often wander away from it for natural landmarks and roadside oddities as we traverse the nation, it will remain our guiding beacon. Our trip will officially begin at the Atlantic Ocean on Tybee Island, Georgia, and as we travel west, we hope to visit some national parks we've missed in Colorado, Utah and Arizona. Oh, and California and New Mexico. And see some relatives and check out a few cities and towns we've never been to. And sort of meander around until we see the Pacific Ocean. Day 1: Logic might dictate that today be called day 0 since we spent it driving to our starting point, but—despite the rain that nipped at our heels most of the day—it was a worthy beginning, so we're calling it day 1. To drive through some areas we hadn't explored before, we took a rather circuitous route that kept us off the freeways until we reached Dublin, Georgia around 6 p.m., just as the sun was making its final farewell beyond the horizon, leaving only our headlights to guide the way. Then we picked up I-16 for the final 150 miles to Savannah. Along the way we stopped in Lawrenceville and Eatonton to find letterboxes. In Athens, we tracked down a couple of quirky roadside attractions. The first was a tree that "owns itself." 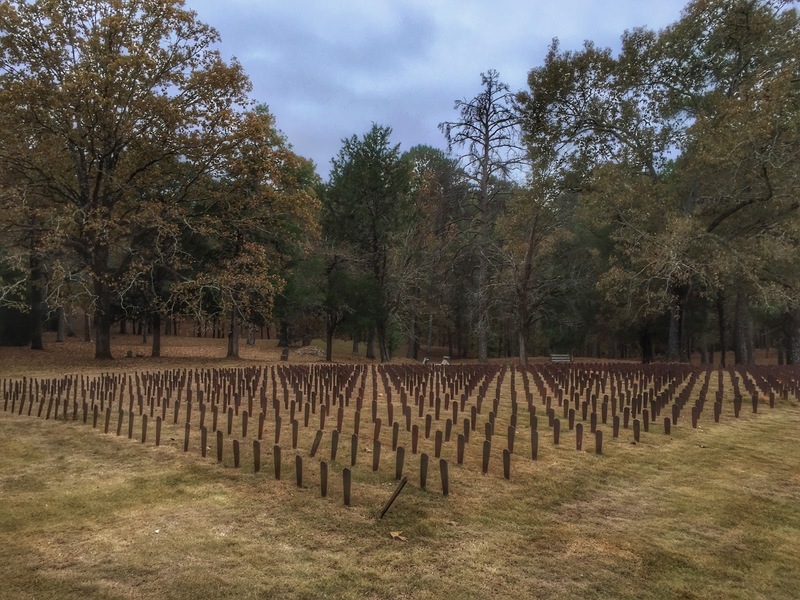 Apparently, a University of Georgia professor reaped so much pleasure from the shade of the oak that he wanted to ensure its survival after his own demise. To prevent the next land owner from chopping the tree down, he devised a will that conveyed possession of the tree and all land within eight feet of the tree to the tree itself upon his death in 1890. FITTINGLY, THE TREE IS LOCATED ON THE CITY'S LAST COBBLED STREET. The 400-year-old tree continued to live undisturbed until 1942 when strong winds toppled it during a storm. 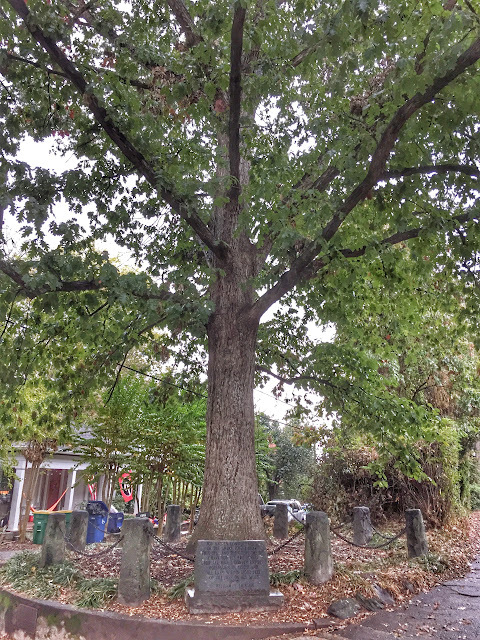 According to legend, four years later, a local garden club planted an acorn from the original tree and have continued to keep watch over it since then. The second oddity was an experimental weapon developed during the Civil War—a double-barreled cannon, whose purpose was to fire two cannon balls connected by a chain into enemy lines and cut down soldiers like a scythe. Of course, the two had to be fired simultaneously, and therein lay the problem—how to persuade the powder behind each shot to ignite at the same instant. It comes as no surprise that the cannon was fired only twice in battle before being retired as a government building lawn decoration. By far the most interesting stop of our journey today was the town of Milledgeville (pop. 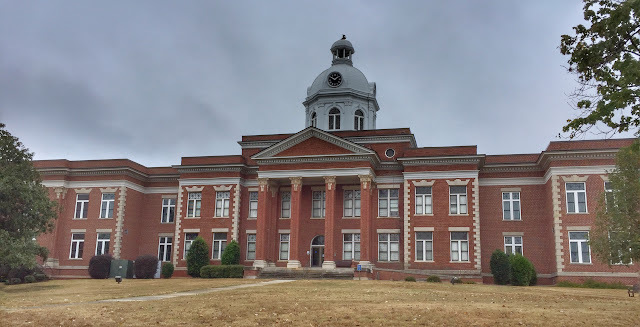 19,401) , Georgia's third capital city and home of the infamous Central State Hospital. 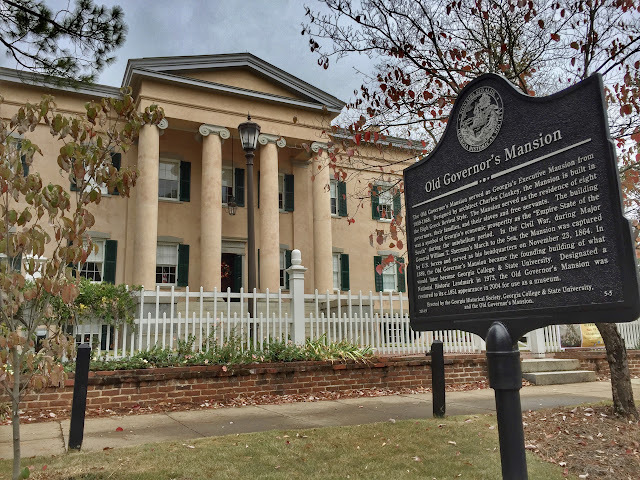 Founded in 1804 as the state's new centrally located capital, Milledgeville was a planned city modeled after Savannah and Washington, DC. 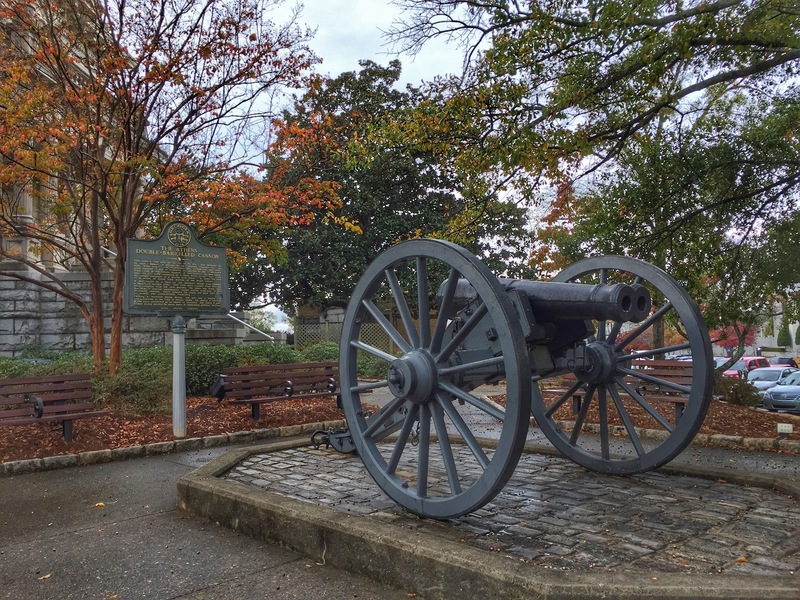 After the Civil War, the capital was moved to Atlanta, and the old government buildings were eventually taken over by local colleges. The campus of Georgia College centers around the old Governor's Mansion, which long served as the college president's home. 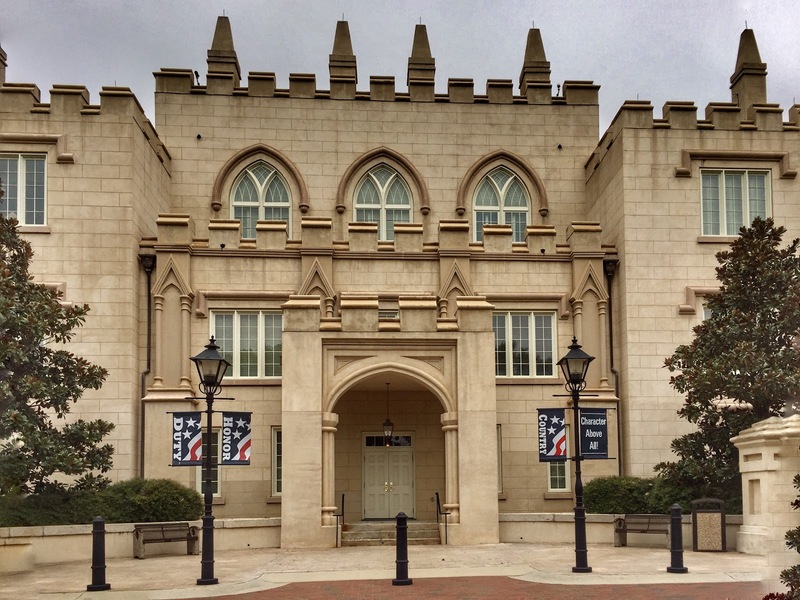 The old state capitol was given over to Georgia Military College. With its surprising Gothic revival architecture and crenellated roofline, it was a perfect fit. All the other buildings on the stately campus share the same style. JONES BUILDING SERVED AS A GENERAL HOSPITAL FROM 1929 TO 1979. After driving through the downtown area with its elegant, painstakingly restored antebellum homes, we were not prepared for the shock of neglect and decay on the Central State Hospital campus. 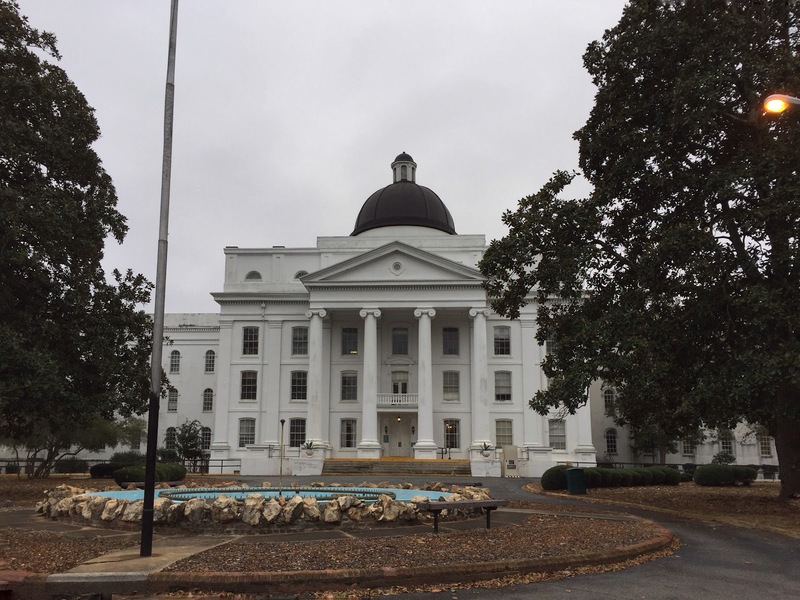 Opened in 1842 as the Georgia Lunatic, Idiot and Epileptic Asylum, the campus grew to become the world's largest mental institution, spread across 200 buildings on 2,000 acres, housing more than 12,000 patients. With inadequate resources and funding complicated by the limited understanding of mental illness of the era, thousands of patients were unjustly committed and brutally treated. Re-development efforts are underway to repurpose the largely empty campus. North of Milledgeville we stopped briefly at Andalusia Farm, the rural estate of writer Flannery O'Connor. The property had long been owned by her family, and O'Connor moved there in the early 1950s after contracting lupus. Her doctors expected she wouldn't live more than five years with the disease, but she defied the odds and made 12, during which she wrote two novels and more than two dozen short stories before her death at Andalusia in 1964. The farm was opened as a museum in 2003. 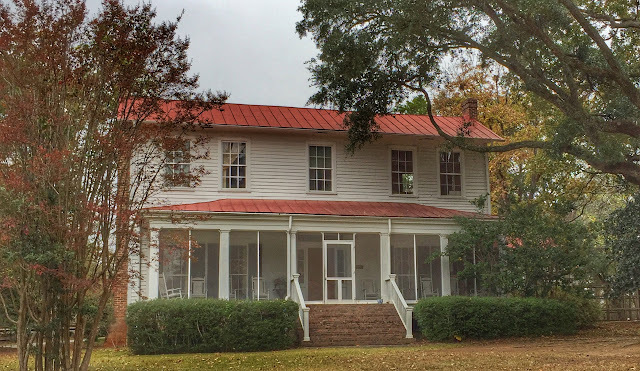 Though there was much more to explore at the farm and in Milledgeville, we had to move on down the road but only after adding the town to our places to revisit list. 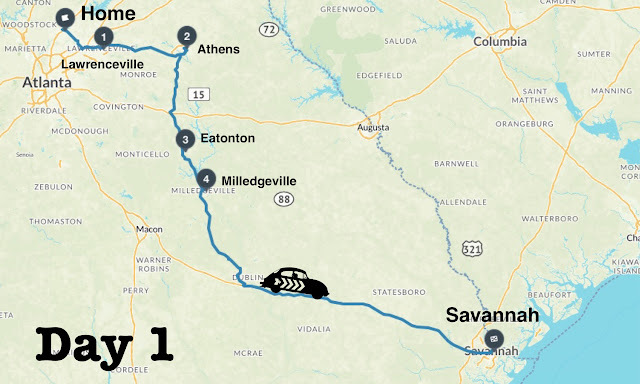 In Savannah, we checked into a riverfront hotel to rest up before beginning this epic transcontinental road trip at the Atlantic Ocean tomorrow. What We Loved: Meeting a tree that owns itself. Of course, it is the offspring of the tree that inherited itself. However, it's pretty safe to assume the original tree died intestate. So with none of its other progeny in the area contesting the situation, the current tree must also own itself. Very cool! 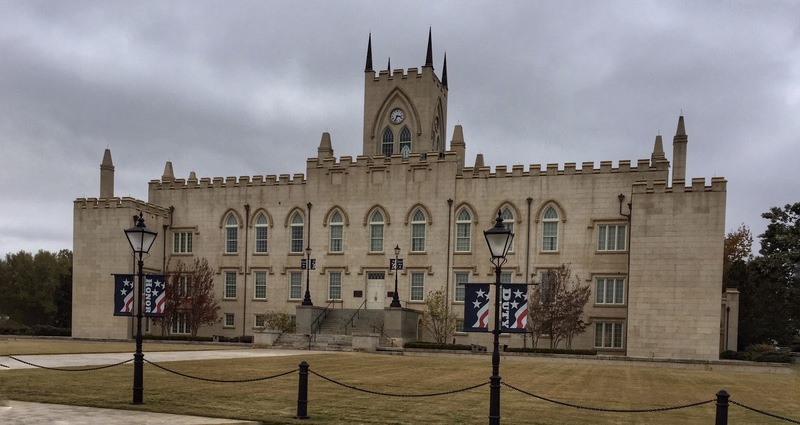 What We Found Lacking: Adequate time to delve into the fascinating town of Milledgeville. 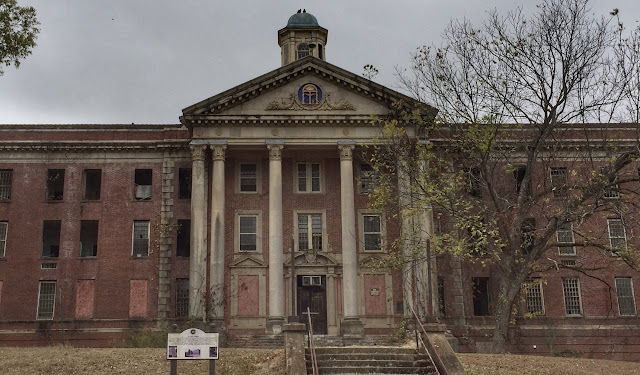 What We Learned: That we are very fortunate to live in a time when citizens cannot be "sentenced" to a mental institution because someone finds them different or odd or their behavior "inappropriate." 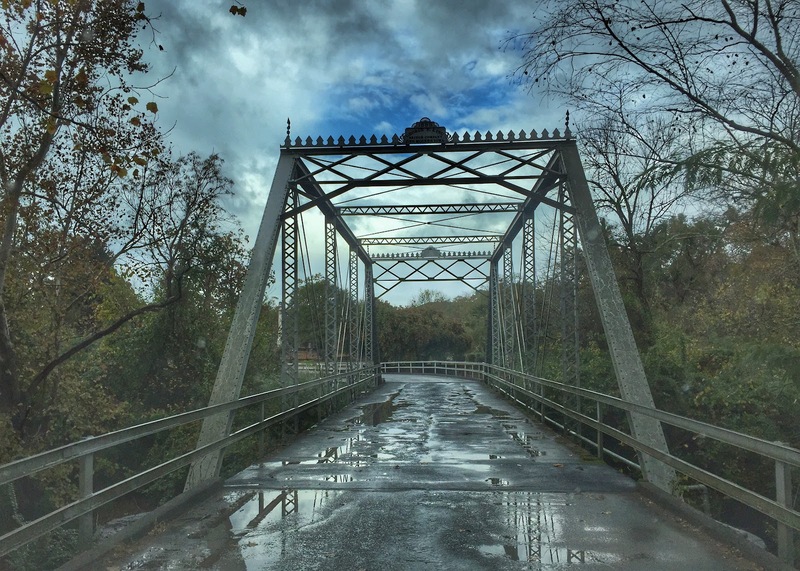 RARE THROUGH-TRUSS BRIDGE AT OCONEE HILL CEMETERY, ATHENS. PUTNAM COUNTY COURTHOUSE IN EATONTON DATES FROM 1824. THE MARQUIS DE LAFAYETTE VISITED THE OLD CAPITOL BUILDING IN 1825. ONLY A FRACTION OF CENTRAL STATE'S POWELL BUILDING IS STILL IN USE. 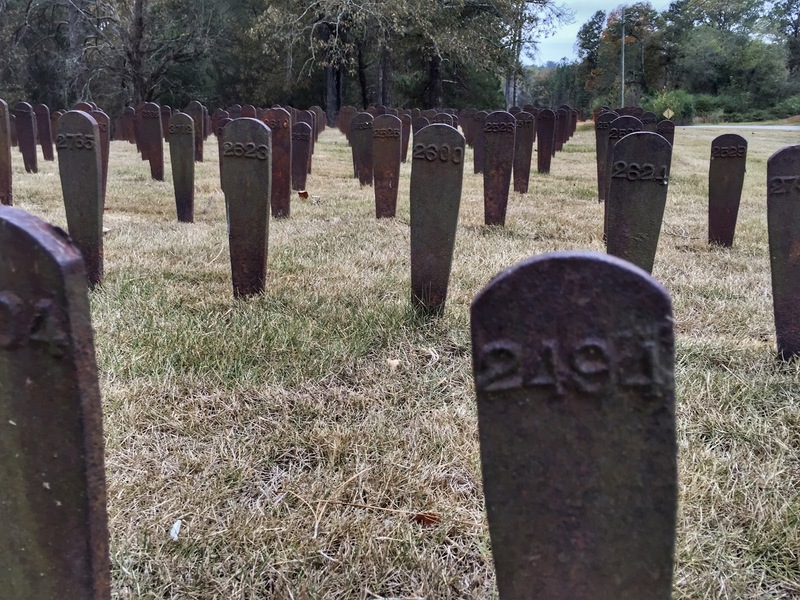 NUMBERED CAST IRON PINS WERE USED TO MARK WHERE CSH PATIENTS WERE BURIED. MARKERS NO LONGER INDICATE BURIAL SPOT AS THEY WERE PULLED UP TO MAKE MOWING EASIER. 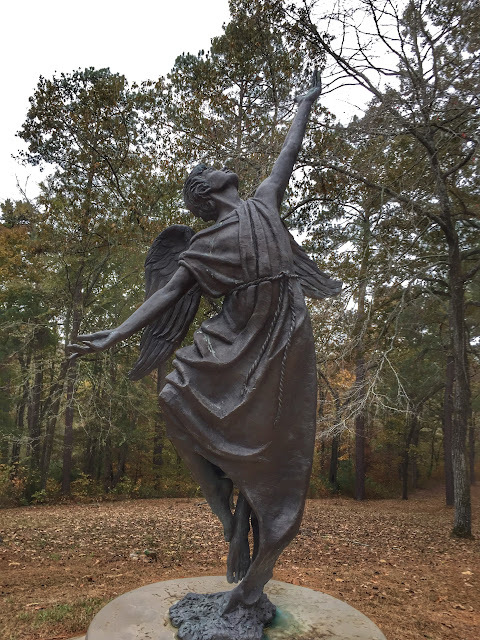 BRONZE ANGEL MEMORIALIZES FORGOTTEN PATIENTS BURIED AT CSH.